One of Apple’s suppliers, Pegatron, reported that a small explosion occurred at one of its locations in Shanghai, China. Pegatron said that a few workers were injured in the blast, but the incident will not have a large impact on production. In a statement released earlier today, Pegatron also detailed that some machinery had suffered damaged, but it would be able to readjust the facility to minimize impact on operations and revenue. The cause of the explosion is currently under investigation. Sources close to the matter confirmed that this facility is partly used to manufacture Apple products. 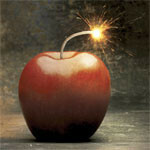 thats the second apple explosion at a Chinese factory in less than a year. Seriously people, wise up to this crap. how many people die/get hurt to bring apple products at rock bottom pricing (so apple can raise the retail price sky high on you) before u demand better of them?? apple is not at fault here, it is the manufacturers fault for not taking into consideration the saftey of their workers. apple keeps a very tight control on their supply line. It was Cook's job under Jobs to keep that tight control. Do you really think that Apple doesnt know what goes on in every nook n cranny in their factories? Those factorys may be owned by another company but they make soley Apple products under apple supervision. dude, come on. people got hurt because apple is run by shytheads. Apple doesn't run the plant, and like it or not, companies like Foxconn etc. also do manufacturing for some of the major Android manufacturers. The real problem in China is that the totalitarian nature of its government has bled down into its corporate culture. I would like to see Apple exercise some of its considerable leverage to convince the contractors to commit to safer practices and treat their workers better, but they are not directly to blame. Apple did exercise its leverage. Thats why ONLY apple plants keep exploding and ONLY apple plants have anti-jumper nets. Its not a Chinese problem, its an apple problem. Apple keeps a lot of control over its entire pipeline. We all know that. To think they dont have control over Foxconn is rediculous. Fcuk me phone arena! A small blast? I it injured 57 people!! I does that sound small to you????? I know, a small blast might be a cherry bomb, but a blast that hurts 61 people is in line with something like an IED from Afghanistan or a hand grenade. I read that 61 were injured & that 21 needed to go to the hospital. Wow what an understatement.